WASHINGTON (CNN) -- The Senate Intelligence Committee voted unanimously Wednesday to send the nomination of Leon Panetta as CIA director to the full Senate for confirmation. 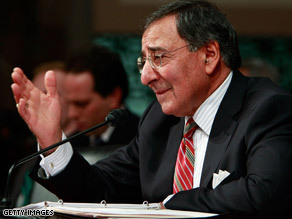 CIA chief nominee Leon Panetta answers questions February 5 at his confirmation hearing. If approved, Panetta, 70, would become the oldest person to head the spy agency. Committee Chairwoman Dianne Feinstein, D-California, said Panetta would mark a "new beginning" for the CIA. "He has the integrity, the drive and the judgment to ensure that the CIA fulfills its mission of producing information critical to our national security, without sacrificing our national values," she said. Sen. Kit Bond, the ranking Republican on the committee, said he supported Panetta after receiving assurances from him that he will "use all appropriate and lawful means" to keep the nation safe. Panetta was an eight-term congressman from central California who chaired the powerful House Budget Committee before moving over to the Clinton White House as the budget director and later as the president's chief of staff. He left government in 1997 and returned to California, where he and his wife created the Leon and Sylvia Panetta Institute for Public Policy, a nonprofit foundation. During his confirmation hearing last week, Panetta was peppered with questions about the Bush administration's interrogation, detention and rendition program and President Obama's efforts to change the policy. He called waterboarding -- the interrogation technique that simulates drowning -- torture, but he said the intelligence officers who carried it out should not be prosecuted. Obama has signed an executive order limiting interrogation techniques to the 19 outlined in the Army Field Manual, but Panetta conceded those might not be enough. He said he would not hesitate to go to the president and ask for additional authority if there was "a ticking bomb situation." Panetta vowed not to send suspected terrorists to other countries where they could be tortured. But he insisted such renditions are an "appropriate tool" if the United States got assurances from the receiving country that the individuals would not be treated inhumanely. Regarding Obama's plan to close the Guantanamo Bay detention facility, he said the task is a very difficult one. Although some prisoners will be tried and others transferred to other countries, he acknowledged there may be a group of prisoners who will have to be detained without trial for a long time. Panetta said he did not see the need for any wholesale changes at the agency. The CIA has the tools to deal with the threats, he said, but it needs to stress the training, language capabilities and diversity that will produce better intelligence. Panetta's nomination initially created a stir among both Democrats and Republicans who questioned the advisability of appointing someone with his lack of experience in the intelligence community at a time when the United States is fighting two wars and battling terrorists. But his lack of experience barely got mentioned at his confirmation hearing. Senators seemed satisfied that he has the confidence of the president, would have a good working relationship with Congress and would retain the top leadership at the CIA. Panetta was not the first choice to head the spy agency. John Brennan, a career intelligence officer who last headed the National Counter Terrorism Center, was the leading candidate until liberal bloggers effectively torpedoed the nomination by linking Brennan to the CIA's enhanced interrogation techniques and to faulty intelligence estimates preceding the war in Iraq. Brennan said he was not involved in the decision-making process for those policies, but he withdrew his name from consideration. Sources close to Brennan said he was pushed by the Obama transition team to step aside. Brennan was subsequently appointed by Obama to be his homeland security advisor at the White House, a position that does not need congressional approval.